The controversy over the new State Parks police barracks has been a near media sensation over the past week. Both daily newspapers, the Niagara Gazette and Buffalo News, covered it, the News even devoting one of two editorials in its high-circulation Sunday edition to calling for a halt to construction. All three local TV stations reported on the story, including State Parks’ decision to suspend work at the site late Sunday night. Following the outcry, New York State Parks halted work on the project, at least temporarily. And you heard about it first here, three weeks ago, in the May 27 edition of the Niagara Falls Reporter. Our readers were on top of the issue from the beginning. It is peculiar the way the entire scenario played out. Even though the City of Niagara Falls presented several alternative locations in the city to State Parks for the site of new state park police barracks, all locations that satisfied access requirements to the falls and gorge for emergency response purposes, the parks agency chose previously untouched open green space at the top of the Niagara Gorge anyway. Why was that? Could it have anything to do with the fact that the new Maid of the Mist boatyard, the boatyard that Maid of the Mist owner James Glynn was forced to build virtually overnight at the Schoellkopf site to save his sinking business prospects, the boatyard that Andrew Cuomo waived all public review in terms of scoping sessions and environmental impact statements, and shelved a National Historic Landmark status application… is mere yards from where the proposed new police headquarters was to stand? Think about it. The monopoly Glynn’s run since the 1970’s is forced out of Canada, losing more than half of its revenue. While the governor got a photo op out of it, nevertheless he’s none too pleased that he had to hand over even more of the Niagara Gorge for Maid’s business survival, given that there is an awakening among locals that the state has exploited its waterfront for far too long and the new boatyard is just more of the same. Some are happy about it, operating under the delusion that somehow subsidizing Glynn to the tune of $100 million by exempting him from open bidding laws so that certain politicians can crow about “saving” a “local, family-owned business” is a good thing, but on the other hand, there are a number of people damn sore about the additional infrastructure on the natural gorge, the crane and the boats and ugly sheds next to the river, and another elevator shaft ruining the viewscape at the top. 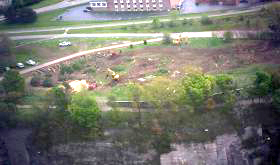 NYPA owned land just north of the Rainbow Bridge, where construction of a police barricades began but was halted after widespread public outrage. Be honest. Can you come up with another single plausible explanation why State Parks would have obstinately forged ahead with plans to build the new barracks on open green space, after the removal of that section of the Moses Parkway for the exact opposite purpose, after the city had spent months offering alternative sites, and after unceasing and bitter criticism of the agency over the past several years? Of course, the plan was for the State Parks Police to serve as Glynn’s Palace Guard. A quick response team to act as a deterrent for any who got it into their thick heads to mess around down there at the decidedly isolated boat and equipment storage yard. And like many other things associated with James Glynn’s Maid monopoly, paid for by taxpayers like you and me. Speaking of taxpayers, and whether anyone has really given them a second thought during this sordid affair, it has been revealed that preliminary excavation of the site has resulted in the cutting down of 52 trees (stumps and all) that formerly graced the top of the Niagara Gorge rim. It has further been passed along to us that the wood from the trees has mysteriously disappeared and is unaccounted for. We would like to know if this wood is presently curing in the back yard, garage or basement of some bureaucrat’s country estate or summer cottage. And we intend to find out. This article is republished from The Niagara Falls Reporter with their permission.